Tangled and True: pink counting birds. We've spoken of Robin Rosenthal before, and I think it's safe to say that I am a big fan. In fact I designed an entire bathroom around her original counting birds poster. It's one of my favorite rooms in the house (is that weird?). 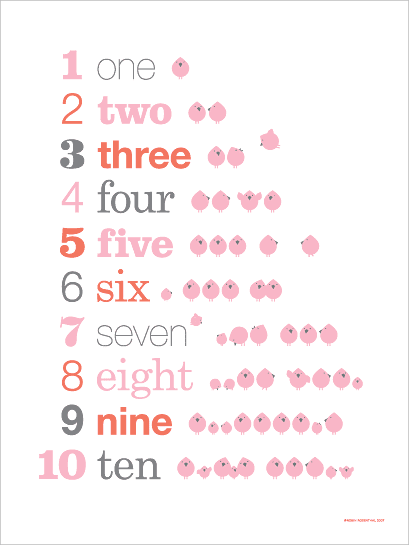 Robin has recently introduced the counting birds in PINK! and I think it's quite a fun color combination. In fact, I'm already dreaming up ways to add this one to my home as well. Which do you prefer.. the green or the pink? I'm loving the green. It seems I have a shortage of pink around my house when I am surrounded by three boys and my husband. Uuugh...why do I love this so much? Guess it will have to go on my wish list! I love it! Especially the green because I have a shower curtain those exact colors and was trying to figure out how to spice up the rest of the bathroom. What a great find!! So cute! I like them both! This is adorable! How perfect for a baby's room...or my classroom... :) Love this! adorable! wonderful design, love it. love that cute print... would be perfect in my little girls room!